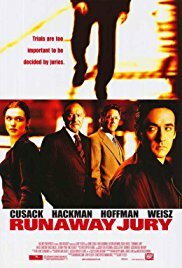 Runaway Jury is a 2003 American legal thriller film directed by Gary Fleder and starring John Cusack, Gene Hackman, Dustin Hoffman, and Rachel Weisz. 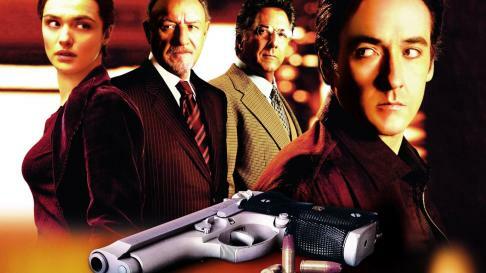 It is an adaptation of John Grisham’s 1996 novel The Runaway Jury.In New Orleans, a failed day trader at a stock brokerage firm shows up at the office and opens fire on his former colleagues, then kills himself. Among the dead is Jacob Wood. Two years later, with attorney Wendell Rohr, Jacob’s widow Celeste takes Vicksburg Firearms to court on the grounds that the company’s gross negligence led to her husband’s death. During jury selection, jury consultant Rankin Fitch and his team communicate background information on each of the jurors to lead defense attorney Durwood Cable in the courtroom through electronic surveillance.